"I see a milksnake, I see a milksnake!". "That couldn't have been a coral snake could it?" (I was not very experienced with snakes at the time). We added the snake, which my boyfriend facetiously named "Jaws", to our collection (after quarantine of course) and he is still one of my favorite animals to this day. Sonoran mountain kingsnakes are generally excellent captives. This species is small, colorful, hardy, and easy to breed in captivity, making it one of the most popular kingsnakes in herpetoculture today. The Sonoran mountain kingsnake is found throughout the center and southeastern montane regions of Arizona in pinon-juniper woodlands, ponderosa pine forests, chaparral, and pine-fir belts. There is another subspecies in Arizona, Lampropeltis pyromelana infralabialis (Utah mountain kingsnake), which has a restricted range in extreme north central Arizona. A third subspecies, Lampropeltis pyromelana woodini, was previously recognized, but has since been merged with L. pyromelana pyromelana. The Sonoran mountain kingsnake is a small, slender species, reaching an adult size of 42 inches (105 cm). (Markel, 1990). The snake is clad in over 41 rings of white or yellow-white bordered by thin black and wide red sections. The black borders may or may not heavily intrude into the white rings. The coloration is similar to that of the western coral snake (Micruroides euryxanthus), causing some experts to believe that the Sonoran mountain kingsnake is a Batesian mimic. Batesian mimicry occurs when a harmless animal evolves to resemble another species which possess an anti-predator defense, such as venom. One study showed that predatory birds avoided attacking banded coral snake replicas, attacking cryptically colored models instead (Brodie, 1993). 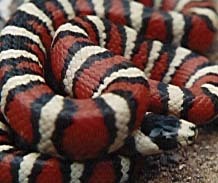 Other than Batesian mimicry, the Sonoran mountain kingsnake possess one other defensive mechanism, pungent musk. When disturbed this species emits a very strong and foul smelling musk. Predators with a strong sense of smell find the musk repugnant and will often release the snake before any extensive damage is done (well warned collectors however, just hold their noses). Sonoran mountain kingsnakes spend the majority of their time hidden under rocks or in rock fissures. Thermoregulation is often accomplished by moving up and down inside rock piles, rarely by basking out in the open. The only time Sonoran mountain kings come out into the open is in search for food, a mate, or a preferred hiding spot or hibernaculum. Often, this species can be found by lifting up rocks at the edges of boulder piles, especially if there is a permanent water source such as a spring or stream nearby. Make sure to always return any lifted rocks to their previous positions, this reduces the impact on the habitat and also preserves a preferred hiding spot which can be checked again for snakes on a future trip. To collect this species, an Arizona general hunting license is required. The daily bag limit is 2 snakes, with a possession of 4 animals per person (Levell, 1995) Sonoran kings are most active in spring and early summer during the mating season, this is the best time of the year to see one in the open. During the winter Sonoran mountain kings hibernate. The wild diet consists of small lizards, rodents, and possibly snakes (Stebbins, 1984). Sonoran mountain kingsnakes, especially captive born animals, make excellent captives. As a relatively small species, an adult Sonoran king can be housed in an enclosure with the minimum dimensions of 3 x 2 x 2 ft (.9 x .6 x .9 m). This species prefers a well defined thermal gradient. The cool end of the enclosure should be 60-65 degrees F (15-18 degrees C) and the warm end should be 80-85 degrees F (27-29 degrees C). This thermal gradient should be used during the maintenance months, but during hibernation the temperature should be 45-55 degrees F (7-12.7 degrees C). This secretive species must have a hide box in the enclosure, as well as one area where the relative humidity is greater than 50% to facilitate proper ecdysis. Appropriate substrates include paper towels, newsprint with soy-based ink, bark chips, and naturalistic substrate collected from the animal's habitat. A clean bowl of water should be available at all times. This species, especially wild-caught animals, may refuse food as early as early August/ September in preparation for winter hibernation. If the snake refuses food for several weeks in a row in the fall, it should be hibernated, providing that it is healthy. Sonoran mountain kings often show a strong feeding response after the winter hibernation period. Wild caught adult animals can carry a heavy parasite load and should be checked by a reptile veterinarian. There are several other problems that may occur with wild-caught Sonoran mountain kings. Wild-caught adults are often prey imprinted on lizards or wild mice and may prove difficult to acclimate to a captive diet of domestic mice. Lizard-scenting domestic mice can be helpful in enticing Sonoran mountain kings to feed. Some breeders have reported wild-caught specimens to be very reluctant to feed after emerging from the winter hibernation period for the first two years in captivity (Cranston, 1994). Generally, all of these problems can be solved over time if the proper captive conditions and veterinary care is provided. The most important factor in breeding Sonoran mountain kingsnakes (besides healthy breeders) is proper hibernation. Sonoran mountain kingsnakes require a hibernation period of four to five months at 45-55 degrees F (7-12.7 degrees C). Before hibernation, make sure that the animal has not been fed for two weeks in order to clear any intestinal contents. Lower the temperature slowly over a period of two weeks until the hibernation temperature has been reached. After the hibernation period, feed the animals, especially the females, twice the amount of the maintenance diet. Smaller food items fed more frequently are easier for the animals to digest than one large meal. Sonoran mountain kings breed earlier in the season that other colubrids from more temperate regions, and rarely double clutch. Some males may refuse to eat after a few weeks into the breeding season (one track minds). Many breeders have had increased breeding success by supplementing the female's diet with calcium. It is interesting to note that snake species that consume lizards as a large percentage of their wild diet often show improved breeding performance with captive calcium supplementation. It is possible that a diet composed of lizards is higher in dietary calcium than a diet of domestic mice, which may account for this phenomenon. Some breeders wait until the female has had her first post-hibernation shed before introducing the male, although breeding may occur before this event if the animals are put together. Gestation runs from five to seven weeks after copulation. Before oviposition occurs, the female will have the typical colubrid pre-egg laying shed (Cranston, 1994). At this time, introduce an egg-laying chamber into the enclosure. The best egg-laying chamber I have found is a plastic shoebox with an entrance hole cut in the lid. Fill the chamber halfway with damp spaghnum or peat moss. Occasionally, females will lay eggs outside of the egg-laying chamber, these eggs often turn out to be infertile. The eggs will be laid ten to twenty days after the pre-egg laying shed. Clutches range from 3-10 eggs, although some exceptionally large clutches from mature females may number 13-15. Incubate the eggs in moist vermiculite (1:1 ratio of water to vermiculite by weight) at 78-82 degrees F (25.5-27.7 degrees C). Incubation times range from 60 to 85 days. The Sonoran mountain kingsnake is popular with reptile enthusiasts for good reason, it is beautiful, relatively easy to care for, and breeds readily in captivity. Because this species is so secretive, it is difficult to observe Sonoran mountain kingsnakes in the wild, but captive born animals can be found at almost any reptile show in the United States. Lampropeltis as a genus is extremely popular with hobbyists, with members like the Sonoran mountain kingsnake, it is easy to see why. Brodie, Edmund D. 1993. "Differential avoidance of coral snake banded patterns by free-ranging avian predators in Costa Rica". Evolution. 47:227-235. Cranston, Thurgess. 1994. "Notes on the natural history and captive husbandry of the Sonoran mountain kingsnake (Lampropeltis pyromelana pyromelana). The Vivarium. 5(4):15-17. Levell, John P. 1995. A Field Guide to Reptiles and the Law. Serpent's Tale Books. Excelsior, MN. Markel, Ronald G. 1990. Kingsnakes and Milksnakes. T.F.H. Publications Inc. Neptune City, NJ. Stebbins, Robert C. 1985. Western Reptiles and Amphibians. Houghton Mifflin Company. New York, NY.